Some call it Catalan Turron. Some call it Nougat. All will agree you're a genius for finding a way to make this classic candy at home. Heat honey in heavy saucepan on medium heat, stirring constantly until honey comes to boil. Remove from heat. Cool 1 minute. Stir in egg whites; return saucepan to heat. Cook until mixture reaches toffee-like consistency (hardball stage). Add nuts; mix well. Spread mixture into 15x10x1-inch pan lined with parchment or wax paper. Cover with second sheet of parchment or wax paper. Weight the top evenly. Let cool. Cut into 1-1/4-inch squares. Preheat oven to 375°F. Soak hazelnuts in cold water for 1 minute. Drain, but don't dry. Bake 10 minutes, or until skins begin to flake off. Place a few of the nuts in damp dish towel and rub to remove the skins. Repeat. 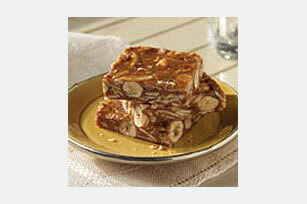 The nuts should be kept warm when making turron. After blanching or roasting, cover nuts with foil to keep warm. Previously peeled or blanched nuts can be warmed in 200°F oven for 15 minutes.